Matte black ion plated stainless steel case with a matte black ion plated stainless steel bracelet. Fixed black stainless steel bezel. Matte black dial with silver-tone hands and index hour markers. Minute scale around the inner rim. Dial Type: Analog. Date display at the 3 o'clock position. Quartz movement. Scratch resistant sapphire crystal. Screw down crown. Solid case back. Round case shape, case size: 46.5 mm, case thickness: 14.8 mm. Fold over with safety release clasp. Water resistant at 300 meters / 1000 feet. Functions: date, hour, minute, second. Casual watch style. 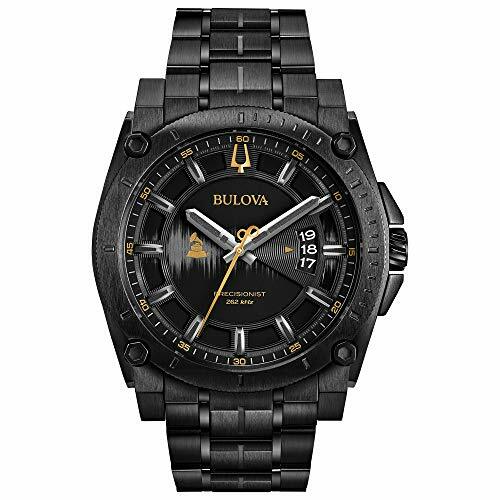 Bulova Grammy Matte Black Dial Men's Watch 98B295.